If you want to find the fastest way to knock out stress, then you are going to want to read this. I am going to teach you a five minute exercise that will help you recapture a sense of calm when you are overwhelmed by stress. Let’s face it, there were times today when you were either stressed beyond belief or just overwhelmed with too many things to do. I am going to show you how to meditate in as little as five minutes. By the end of this post, if you follow the instructions, you will have decreased your stress, feel more capable, and increased your level of focus. You can achieve this level of calm anywhere, at any time, once you know it. Not bad for five minutes. 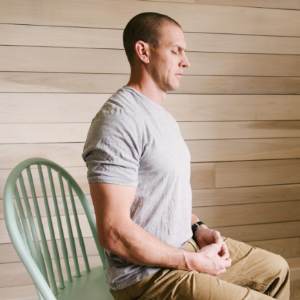 This lesson has seven basics steps to get your back to feeling calm. For a complete meditation guide you can download the resource sheet that gives you a list and links to the resources that guide you to deepening your practice. Click to download the complete resource sheet. It’s best to meditate in loose, comfortable clothes. Tight or restrictive clothing makes it difficult to breath properly and often times makes it difficult for you to notice your entire body. If you can change into looser fitting clothes, then do it. If you can’t, take steps to loosen what you are wearing. Take off jewelry, unbutton shirts, etc. It might not be possible to eliminate all noise when you start meditating, but you can turn off the distractions that you are responsible for. Turn OFF your cell phone, radios, televisions, etc. Find a quiet place to meditate where you will not be disturbed for five minutes. You can choose your car, a room in your house when no one's home, or anywhere in your house before everyone wakes up. You can even meditate at work in a conference room. 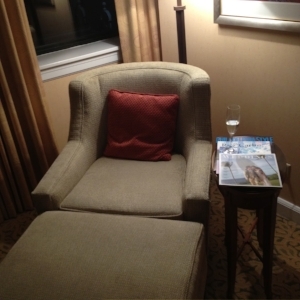 Sit in a chair with your feet flat on the floor, with your chest up and your shoulders back, but relaxed. Place an arch in your lower back and have your head resting in a position that is not straight ahead and not looking in your lap. The midpoint between those two positions is perfect. Place your hands in your lab or on the arms of your chair if it has them. Place your focus on your breath. Feel the sensation of your chest rising and falling, the air entering your mouth or nose and your breath leaving your mouth. With every exhale, feel yourself relaxing and sinking deeper into your chair. 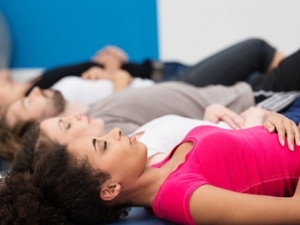 After these three deep breaths return your breath to its normal rhythm. Notice when your mind starts to wander. It eventually will. When it does, do not try and stop yourself from thinking. Gently bring your focus back to the breath, enlisting all of your senses. It is important to remember that your mind may wander repeatedly. In each case simply return your attention to the breath. 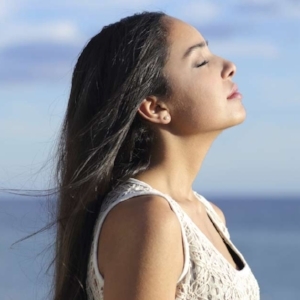 As you breath, with each exhale, feel your body becoming calmer, feel your muscles soften and relax. Take notice of the pressure on your chair, or wherever you are, as your body loosens. Feel your connection with your feet and the floor. Once you have scanned your body, bringing awareness to your chair and your feet, count out each time you complete a full breath. If a thought enters your mind while you are counting your breaths, simply start again until you can take three full breaths. Once you have been able to count three breaths, bring your awareness back to the room and gently open your eyes. Just follow these steps any time you are feeling stressed or overwhelmed. Continue to breath, while bring attention to your entire body. Count three breaths and open your eyes. These steps will help you become calmer whenever you find yourself feeling overwhelmed. Now that you feel calmer, you’ll want to deepen that feeling. It will come from practicing this once a day. But there are other aspects to keep in mind, and I outline them in a reference guide that you can get for free by signing up below. If you want to be able to deepen your practice and experience a more profound sense of calm then download the resource guide that will explain exactly what you will need.